Don't let my all-black wardrobe fool you... I am in fact a colour person, which is one of the reasons that I find the current available colours of Aida Cloth so darn frustrating. Let's see... 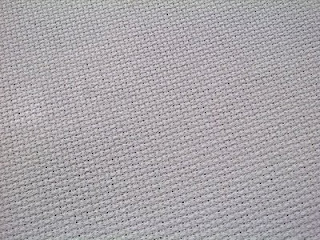 I'm planning on beginning a new cross stitch project and the colours of fabric I have to choose from are white, off-white, black, natural, and a rather anemic selection of awful pastels. Sorry folks, that just isn't working for me. 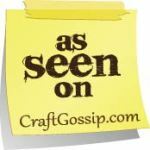 ~ White Aida cloth in the count you prefer - we almost always use (and design with) 14 count. ~ Regular ol' acrylic craft paint (available at pretty much any craft store - although we don't recommend using dollar store craft paint... go ahead and ask us how we know that). ~ Textile Medium Liquid - usually found in either the fabric paint aisle or with the acrylic paints - we use Delta Ceramcoat and we love it. We buy it at Michael's. ~ Foam paint brush and a small container to mix your paint in. 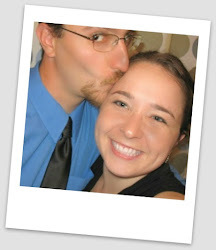 Okay... let's take a quick break to answer a few questions you undoubtedly have. 1. Why the heck don't you just use regular fabric paint? 'Cause it's expensive and we're cheap. Acrylic paint is much cheaper than fabric paint, comes in a wider range of colours and mixes well. The bottle of textile medium is a little more expensive, but a little goes a long, long way. 2. Do I have to use textile medium? Can't I just paint right on the fabric with the regular paint? Yes you do and no you can't. The textile medium helps the acrylic paint to sink into the fabric - keeping your Aida flexible and making it ironable/washable. Without it, the acrylic can just sit on the surface and flake and crack. That's not very nice! Now... back to the business at hand. Firstly, prep your work surface. We like throwing down a piece of waxed paper to work on, although any clean piece of paper would work too (don't use newspaper, the newsprint will rub off on your fabric... again, don't ask us how we know that!). Waxed paper works well because it's cheap and it doesn't absorb the paint, risking it seeping through to the surface you're trying to protect in the first place! Cut your white Aida cloth to the size you need. For a pattern that's 5x7 we literally cut our fabric to 5x7 - that way there's no waste at all. But if you prefer to trim your fabric after you've completed stitching, that's cool too. The nice thing about painted Aida is that the edges are sealed - so they won't fray as you work! Next, mix your paint to the colour you're trying to achieve. For softer colours it's nice to start with white paint and tint it with a little colour - in this example we're going for a soft grey. If you wanted a brighter, more vibrant colour, just go with what's in the bottle. Remember though, once you get it on the fabric, the colour always looks stronger! Trust us. When all else fails, err on the side of caution. If it's not as dark or vibrant as you wanted it to be when it's all finished, you can always repaint it. Before you begin painting you need to mix in your textile medium. Our brand recommends a 2-1 ratio of paint to textile medium. We don't measure exactly... if you have a little too much medium that's okay. The nice thing about the textile medium is that it doesn't alter the colour of your paint! Really now all you have to do is apply your paint to your fabric - we like using a foam brush because they're really inexpensive and they achieve great coverage. You want to make sure you get every bit of your fabric painted evenly. It's going to look like the tiny holes in the Aida are all filled in with paint. Don't worry - as the paint absorbs into the fabric the holes will reopen again - and if they don't, then your needle will still go through. You don't need a million coats of paint - truth be told, one coat usually does it. We go side to side with the first pass, and then up and down on the second to make sure no little white parts are showing through! Now comes the hard part - waiting for the paint to dry. In the meantime don't forget to clean up! 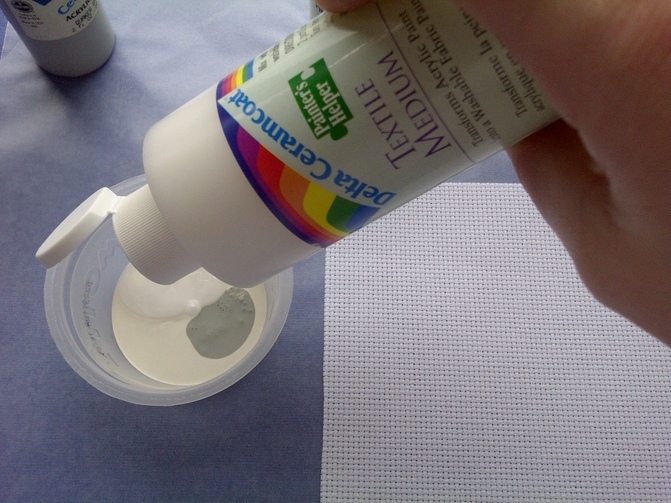 If you have leftover paint you can keep it in a sealed container to use the next time. That's okay! It means the paint/textile medium has done it's job and permeated the fabric instead of just sitting on the surface. It may not look too pretty, but no one's going to see the back anyway. The last step in this process is to heat seal the paint to make it washable and permanent. We recommend a hot iron on cotton setting without steam. We have an iron dedicated just to crafting, so we're confident to iron directly onto the backside of the fabric even though a little paint has seeped through. 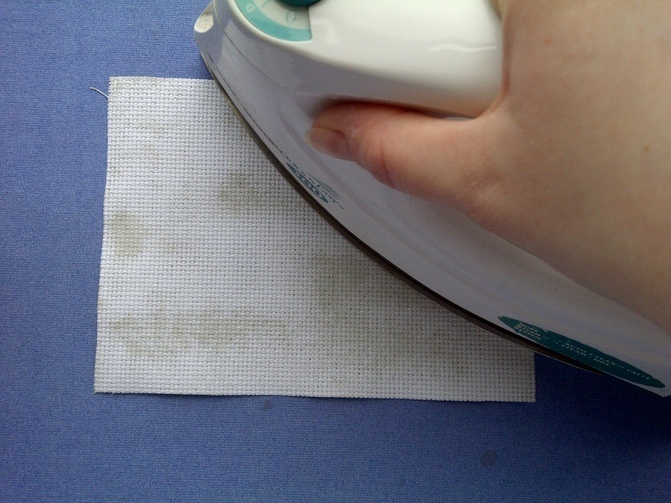 You can also use a pressing cloth to protect your iron if you like. Either way you're going to smell a little acrylic paint sort of smell. That's okay! Just keep your iron moving in circular motions for a few seconds to set the paint (half a minute usually does it). The textile medium we use recommends allowing 7 days for the paint to cure after you've heat set it before you wash the piece - but you can still stitch on it in the meantime! See? Looks pretty good - unless you flipped it over, you'd never know it wasn't grey Aida cloth to begin with!! You may find that the paint has made the Aida a little stiffer. Personally, we like it that way, since it's easier to stitch on without a hoop (I generally don't use a hoop at all). But you can still hoop your fabric like normal if that's your preferred method of stitching. Once your stitching is completed, the fabric can be ironed on the backside just like normal! And that's it! Instead of being limited to the small number of colours of Aida cloth commercially available, you can now, quite literally, make millions of colours!! With only a few basic colours of paint, you can mix an entire rainbow of personalized, one-of-a-kind colours of Aida cloth. Have fun! I've wondered how you got those wonderful colors I haven't been able to find in the store. I love the taupe...it's a great neutral color that shows off all the thread colors, light & dark. Is that one of YOUR creations? oh that is so friggin smart! I am always looking for colored cloth, which is impossible to find around here. And I don't like ordering online because I tend to be the instant gratification type who wants to start a project the second I think about it. This is perfect! holy cow! what a spectacular idea! i have one question though, that might be a bit foolish. you say "the fabric can be ironed on the backside" after stitching. does that mean you shouldn't iron the front side? Generally, it's a better idea not to iron directly on your stitches. At best you'll squish them down, at worst any gunk on the iron might come off on the stitching (aggghhh!). 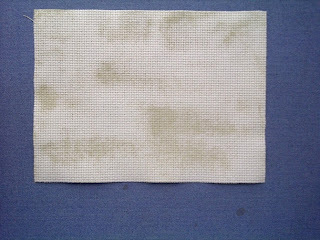 I usually stitch my piece, wash it (gently, in the sink, with plain hand-soap (liquid) or Ivory soap), then put it face-down on a terry towel and iron it dry. No gunk, no squishing, nice and clean and ironed flat. I know I'm a bit behind the times in saying this, but thank you very much for posting this tutorial! I've always wanted to try and make my own Aida colors, just because it sounded fun, but wasn't at all sure where to begin with it. This article was immensely helpful. I want to turn my all white aida cloth to black. Would I be able to use this method? Great tutorial, thanks !! I would imagine this would also work on evenweave ?? Does the fabric need to be 100% cotton for this to work ?? I've never tried this on anything *but* cotton, but any natural fiber (like linen) should work. I'd be sure to read the instructions on the bottle of fabric medium before I started painting and do a test piece, just in case. I don't see why it wouldn't work on evenweave. Thanks, I will give it a try after the Holidays. Hope yours are happy !! Thanks for this wonderful tutorial! Now I have a question. Would it be possible to use a stamp say a snowflake and just stamp it around for a background on say a light blue aida cloth? I don't see why not! Because of the textured weave of the aida cloth the stamp might not turn out perfectly, but I think it would be part of the charm Definitely worth giving a try!! I love it! I was at Micheals looking for cloth and was so upset that they were sold out... I'm new to cross stitching, where do you normally get your cloth? Can't wait paint and get started! Sometimes you can find white Aida in the most unexpected places - like Walmart! I've been painting my own aida for more than 10 years. Yes, you can stamp on it using the foam stamps, and it turns out great. I have even made metallic colors, glittery colors, and every color under the rainbow. Have fun with it! This is amazing! Thanks for this tutorial. I am not itching to go to Micheal's as I love colour Aida but not the selection! I absolutely love this idea, but have to ask - "Will painting the cloth this way affect the color of your threads?" Not at all :) Provided the paint is given time to dry and is heat set then it won't affect the thread colours in the least. Thank you so much! I have to restart a huge project and can not find the fabric, this is perfect! I am so glad I found this tutorial on sprite stitch. I have a piece that needed to be half red and half green and I was not looking forward to stitching the whole background. I do have one question though, after painting and ironing it is super like unbendable stiff. Will the cloth get softer, more supple after washing it? I was hoping to use this tutorial for cloth to use on pillows or something. How does it do with bleeding colors? I sell on Etsy and I get done with an in-depth, high end project just to wash it for framing/assembly and have to watch the reds bleed everywhere. I am extremely frustrated with that and have been working a lot of projects without the reds. But I came here to this page after searching for something that would lock the material down prior to washing, so the soak in of the bleeds won't happen in the first place. Have you experienced any noticeable difference there? I have had red Aida cloth (commercially bought) bleed before, which is one of the reasons why I started painting my own! Such a heartbreak when that happens. I've never had Aida I painted myself bleed in any way - if you follow the instructions for the fabric medium (amounts and ironing time, etc) it will be completely colour-fast. The fabric medium we use does recommend waiting a certain amount of time for the paint to 'cure' before washing -- and you need to heat-set the paint too as per the instructions. I always wash my stitching in lukewarm water, not blazingly hot and of course I only ever let it air-dry. If it's the red colour from your embroidery floss which is the culprit then I highly, highly suggest changing to a different brand of floss. We only use DMC floss, which is very good quality and has NEVER bled on me - ever - in twenty+ years of using it. I've a question. Does the sizing need to be washed out before painting the Aida fabric? The Delta textile medium says to pre-wash fabric to remove the sizing, but in your tutorial it looks like the painting is done on the Aida as-is. I've got an unusual question. My mom made a beautiful cross stitched angel with heaving beading. The design is solid stitching and beading. She put this on a sky blue aida cloth which matches nothing in my home. Is it possible to paint the aida cloth as you've described above after the piece is completed. You could... But it would be darn tricky trying to paint up against the stitching without getting any paint on the floss. Also, I'd be leery to iron anything with beads on it at the temperature you'd need to use to set the paint, which us pretty hot. Hopefully you haven't already answered this question. Can you paint both sides? I want to do a cross stitch pattern on a dark red Aida cloth and to have one side (possibly) blotchy red/white would bother me. You definitely could paint both sides. I'd just wait until the first side was dry before painting the second, and I would use a pressing cloth when ready to iron. Tried this technique this afternoon and just have one problem. It is dry now and all 4 pieces that I did seem to have some areas where the holes are filled in. Should this have happened? I used 11 ct. instead of 14, but didn't think that should make a difference. ??? Thanks. have you tried this painting method on other than aida...e.g. linen and even weaves? Have you tried painting colored aida at all? I ordered a natural color aida that appeared much darker online than it is in real life, and I prefer the darker color for the project I plan to use it for. Do you think the natural aida could be painted to darken it up a bit? I just saw this post for the first time today.I've been painting on fabrics of all sorts for years,sometimes I used textile medium and other times I used water,both worked and as long as they were heat set,they never bled or washed out. I was into the wearable arts for years when my kids and grand kids were small,i also was/am (although not too much anymore) a tole painter,quilter,seamstress etc.So I've painted on lots of stuff over the years. So having done all that,let me say use the ceramcoat paints ! Do NOT use Apple barrel brand as it doesn't have enough pigment in it,and your results won't be as good. When I mix the paint with water,i do wet the fabric first,you can do this by spraying or just dipping it in water,do not wring out,blot with a towel if too wet.This helps the paint stick/absorb into the fabric.If using textile medium,you can skip that part. Just remember whatever method you do the trick to having it not fade or wash out is in the ironing,and heat setting it.Have fun,and remember you're limited only by your imagination!!! You say that you've used water - I'd be curious to know an estimate of the ratios you use. I've not had any luck finding textile medium in any of the stores around me. Do you just paint onto wet fabric or do you mix the paint with water first? Nice ideas.i like it.we have to make our designs with favorites color combination. I just found these GREAT little 6x6 pieces of aida stretch on a little wooden frame at Michaels (while visiting family in MD) and I immediately thought, "how can I make them NOT stark white aida"! How excited am I to find this tutorial!! LOVE IT! And, I will be back to buy your wee stitches of Star Wars characters to do for a teacher gift for the next school year for gift for male teacher our daughter will have!! Cannot wait! Thanks for sharing!! SO glad I found this! Will definitely have to try. I used to be able to find all kinds of beautifully colored Aida cloth, but I think cross stitching has gone out to some degree, because it's difficult to find much of anything anymore. I wanted to by orange for halloween Get this... Joanns wanted 30.00! I bought a 5.00 bottle of orange Rit. Job done. I will remember ur way next time DEFINETLY! If you've used the fabric medium and heat set the paint as per the instructions, then yes you can launder it. All the brands of textile medium I've used recommend an amount of time to let the paint cure before you launder it (usually 72 hours or so) but you can still stitch on it in the meantime. Terrific technique! 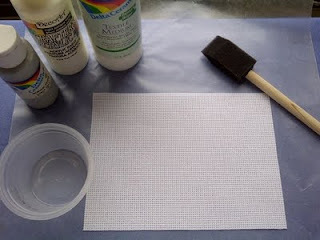 Instead of cross stitching, can you paint (with acrylic) on the aida cloth to look like cross stitch? As in squaring off the corners? Would this technique work on regular cotton fabric to paint on? Or embroider/cross stitch on? You totally could paint the stitches on the fabric instead of stitching them - it would be time-consuming, but could be really cute. 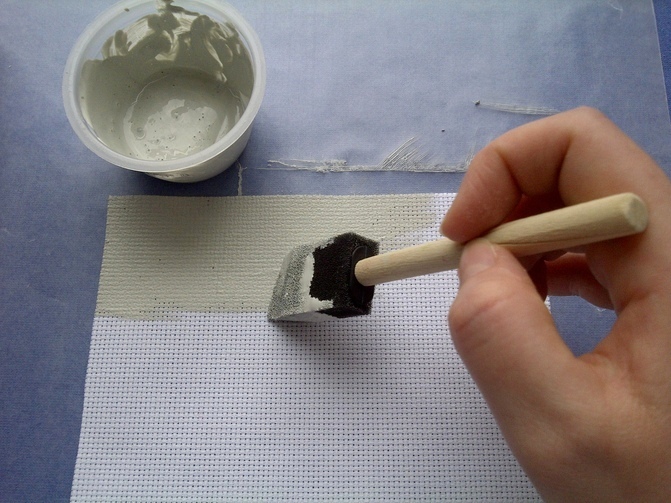 There are several tutorials floating around for painting faux cross-stitching on walls, so a similar method could definitely be applied to fabric. Yes, you can paint any cotton fabric. I've used fabric medium to stamp on t-shirts and pillow cases with great success. Just remember that the paint/fabric medium combo does make the fabric a bit stiffer, so I wouldn't want to do huge swathes of fabric which might be worn. I never have to do a second coat the way I paint my aida, so I don't know exactly how well that would work, but I don't see why a blow-dryer wouldn't speed things up. The heat from the blow-dryer may set the paint a little though, so you wouldn't be able to launder out any mistakes that you've made. 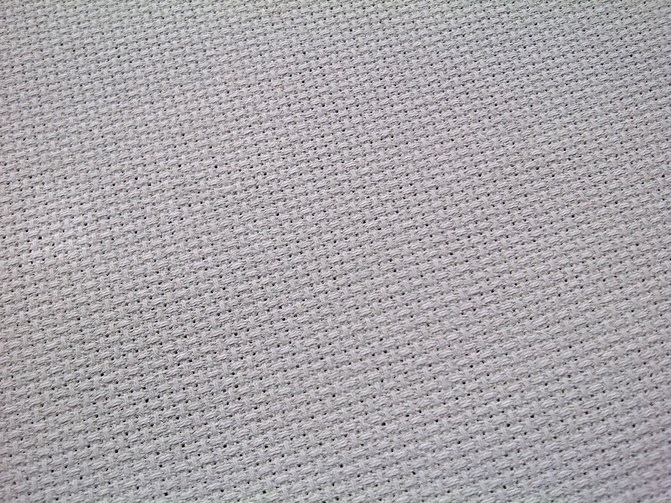 This just may solve my issue for an upcoming project so I don't have to stich the dark brown background on 22 count!! I was wondering if you have ever tried to paint the aida with glow in the dark paint? Thinking I just may have to try that. I am so glad I found this post on Pinterest! It never even occurred to me to paint the aida cloth. I usually stitch on 16 or 18 count and they seem to have even fewer color choices then the 14. Now back to the top of the page to sign up for your newsletter.